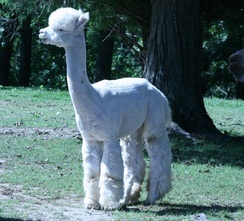 Roku was Miss Peruvian Jules first cria. He was stepped on by Jules when he hit the ground and had his sholder dislocated. Because of this injury he has a right foot aligned to the right and did not do well at shows because of conformation. Roku has inpecable fiber and conformation otherwise. 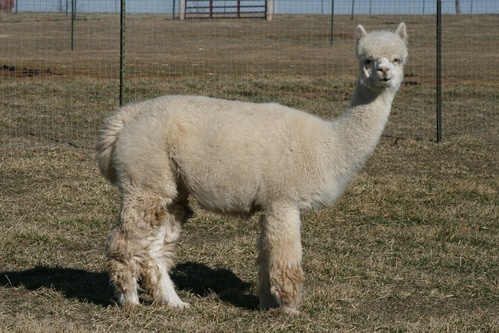 He was bred to 3 females before he was sold and I am sorry we sold him. 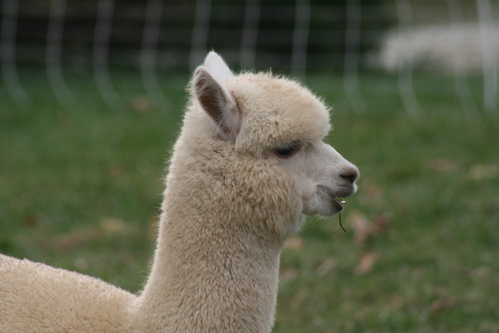 All his cria are fantastic. I guess coming from a lineage of PPeruvian Caligulia, PPPeruvian Grand Master 6019, Grand Alero on his sires side & PPPeruvian El Moustachio 6003 on his dam's side, you can't go wrong. His genetics include Grand Master and Caligula on his sire's side and El Moustachio on his dam's side. His conformation is perfect and his fiber is fine, long and lucious to the touch. (Lucious is not on the judge's score card, but it is on mine.) He is fine, too. His micron was 17.7 at age 13 months. Roku is gentle and easy to handle. Roku was featured in the April-May 2007 issue of FredSavings.com. This publication included an article on our farm and yarn shop. Roku became an instant star with the photographer when he came up and "kissed" the camera lens. Oh, yes... the article was very good as well. In the adult male field he has taken a position near the top of the pecking order. However, when I called his name in the morning he still came to the fence and gave me a sniff, but no kiss. How quickly they grow up. Secret Garden is a new addition to or herd in the spring of 2010. We could not pass up Secret Garden and her 2 offspring, Bella Sara and Indiana Jones. All three reside on our farm. Bella Sara is bred and Indy is ready to start breeding. Secret Garden is an exceptional daughter of the incredible PPPeruvian Azul Celeste 4865. Azul Celeste may very well be one of the best white females ever imported into the United States. She was imported from the Rural Alianza region of Peru, well known for it's Quality. Azul is the Dam to some amazing sires including Rensselaer and El Senor and Grand Dam to The Aga Khan. Rensselaer has many Champion offspring, El Senor recently sold at auction for $165,000 and Khan is an 11 time Champion. Secret Garden is just like her mom in looks and fiber. 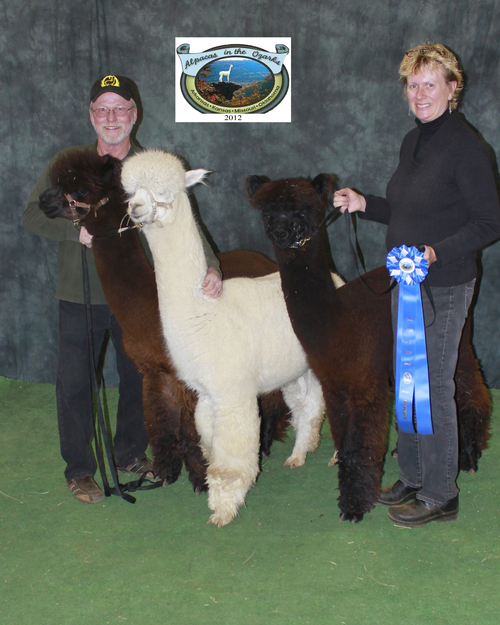 She has thrown us an amazing male Roku's Harronimus, who won multiple first places. We purchased Secret Garden, Bella Sara and Indy in a package and are so impressed with them all. With a mother like Secret Garden and Sire like Alvatar Roku and the amazing lineage they possess, it's no wonder Harronimus (aka Harry) is so wonderful. Harry's bright fleece has an incredibly soft handle, advanced structure, tiny bundles, and great staple length. His conformation is impecable. His personality is so sweet and he is very easy to handle. Training Harry was a dream. It was like he was born to be shown. He has become a mature macho male with a champion presence. Even if he sells, he will be part of our breeding program in the future. Harry's famous cousins Rensselaer, El Senor and The Aga Khan better look out for this youngster. 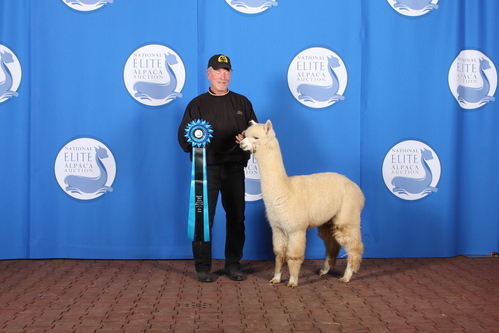 Harry came in 5th place at the Mid western 2011 alpaca show. Fifth dosen't sound so good until you compare the competition. It was very stiff and Harry held his own being the oldest in the class. Judge Amanda vanden Bosch called him the "Fiber Monster" as his fleese is so long already. Harry will be trying out his breeding skills soon. We will keep you updated with his progress. Call today and set up a visit to meet Harry in person. 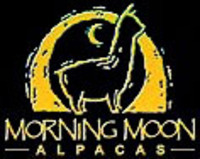 It will be worth your trip.